Jason Baney was one of the “founding fathers” of this website when we started out as 6mmBR.com a decade ago. Jason’s latest project involves an interesting wildcat, a mid-sized 7mm cartridge based on the 6.5×47 Lapua case. 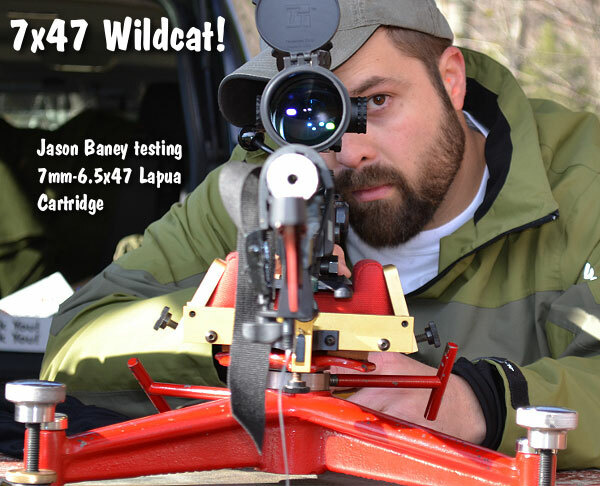 In this report, Jason (who now works at Eurooptic.com) talks about the 7×47 wildcat and his initial velocity (and feasibility) tests. To determine the 7×47’s velocity potential, Jason did a multi-stage test, cutting a barrel in two-inch increments. This process is illustrated in a video, embedded below. You may be surprised that the little 7×47 cartridge could drive a 180gr Berger Hybrid at 2770+ FPS with a 32″ barrel and Reloder 17. Max Velocity with H4350 (and 32″ barrel) was roughly 70 FPS slower. With a 24″ barrel length, the 7×47 was still able to propel the 180gr Hybrids over 2600 FPS with H4350. That’s impressive performance for a mid-sized cartridge pushing a very big bullet. The biggest enemy in long-range shooting is wind. This also happens to be the hardest to gauge and predict. The only way mere mortals can attempt to defeat the wind demons is to shoot a cartridge with the most ballistic efficiency, yet maintain a user-friendly combination of recoil and component consumption as well as performance on target. The 7mm bullets tend to yield the best compromise of all of these aspects. Their BC-to-weight ratio is outstanding and 7mm bullets provide sufficient impact energy for most situations. In addition to that, the recoil of 7mm bullets can be more manageable than heavier/larger .30 and .338 caliber projectiles. In cartridge design, of course you want the best case possible. Having used the 6.5×47 Lapua since its release in 2006, I felt this cartridge was the perfect choice to start with as I wanted a true short-action non-magnum round that gave the least possible wind drift to 1000 yards. The 6.5×47 parent case also allowed seating of the heavy 180gr class bullets completely out in the neck yet it maintained an overall length that would actually work in a factory Remington short action magazine. Share the post "7mm-6.5×47 Lapua — New Mid-Sized Wildcat Cartridge Tested"
Here’s great news for fans of wildcat cartridges and for any hand-loaders who need dies with custom dimensions. 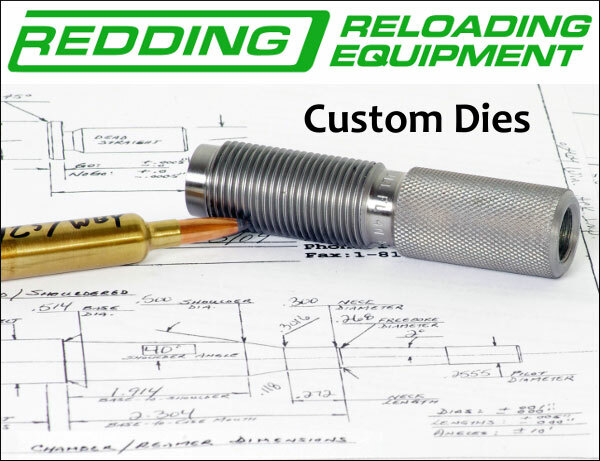 Redding Reloading Equipment will now be making custom dies again. The procedure for ordering dies is outlined below. You’ll need to provide a chamber reamer print or three fired cases. Redding is now able to offer custom dies because it has expanded its manufacturing capabilities in recent years. Redding has more than doubled the number of its CNC machines, expanded factory floor space by 40%, and added many new skilled workers. This growth in production capabilities has allowed the company to again accept orders for new Custom Dies and Die sets. Share the post "Redding Resumes Custom Die Production for 2015"